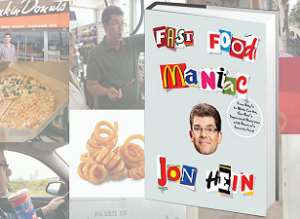 There might not be another human on the planet that thinks about fast food the way Stern Show producer Jon Hein. So it makes sense that Hein dedicated his second book to the subject. Hein’s book, titled Fast Food Maniac, was published in February of 2016. The book chronicles the history of major national and regional fast food chains, revealing secret menu items along the way. “Unlike Super Size Me or Fast Food Nation, Hein’s Fast Food Opens a New Window. Maniac is an unapologetic love letter to that most American of institutions,” wrote Men’s Journal. Which is great for fast food fans, as Hein has included rankings on everything from fries to mascots (and everything in between). Hein originally started on the Howard Stern Show back in 2006 by hosting Super Fan Roundtable. He has been with the show ever since, and his role with the show controls to grow and evolve. Is there an audio version of Fast Food Maniac? Did Jon Hein own the website jumtheshark.com? Yes, there is! As many Stern Show fans know, Sal and Richard has already made good use of Fast Food Nation’s audio book. The audio version is narrated by Jon Hein and lasts almost six hours (5 hours and 47 minutes). Yes! Hein created the website based on the idiom “jumping the shark” which originating from an episode of Happy Days. He also wrote a book, titled Jump the Shark: When Good Things Go Bad. Hein sold the site in 2006 to the owners of TV Guide for over a million dollars.